Anyone with even a passing familiarity with le vin will have at some time or another experienced the pain of being asked to choose a SUBLIME glass of wine for an expectant friend who, frankly, wouldn't know a sublime glass of wine if it dripped straight from Jesus' wrist. It's delicate. You just have to choose something obvious and pleasurable and not oversell it and hope that the friend in question is in a generous mood. Don't do as I did the other day to my poor friend B, and inflict a fairly geeky, intimate, some would say unhygienic vertical tasting of leathery old Margaux that, due to the expense of the wine involved, requires a great deal of glass-swapping among people who have just met. After a few brief kamikaze thoughts of sharing, among six people, one bottle of each of the three vintages on offer - '79, '80, '81 - my other friend J and I came to the prudent conclusion that it would perhaps be wiser and cheaper to sacrifice some social convention in order to taste a glass of each vintage first, among the six of us, before reaching a communal decision on which we'd most enjoy a full bottle of. '79: The feistiest of the bunch, and the clear favorite, despite the murky color of the wine itself. A whisper of deep dark fruit among all the tea, pencil lead, and armchair leather. Enough acid to actually pair with food, though we didn't. '80: A little dead on the nose. I think there may have been just the faintest echo of cork taint going on, but I don't think J agreed. Easily the most joyless of the three. What flavors were there were all savory: old leather, dried meat, bitter tea. '81: Surprisingly forceful, but a little lugubrious overall. The fruit was there but its lights were out. Dried prune on the nose, still some wood tannin evident on the palate. And what did my poor friend B make of it all? Not sure, actually. She said she liked the '79, but then she and her friend split after the first sips, claiming fatigue. I'm pretty sure they went to a club. After which the rest of us all found a table outside, switched to simpler, stranger, more pleasurable weirdo wines from the Loire, and did some serious drinking. 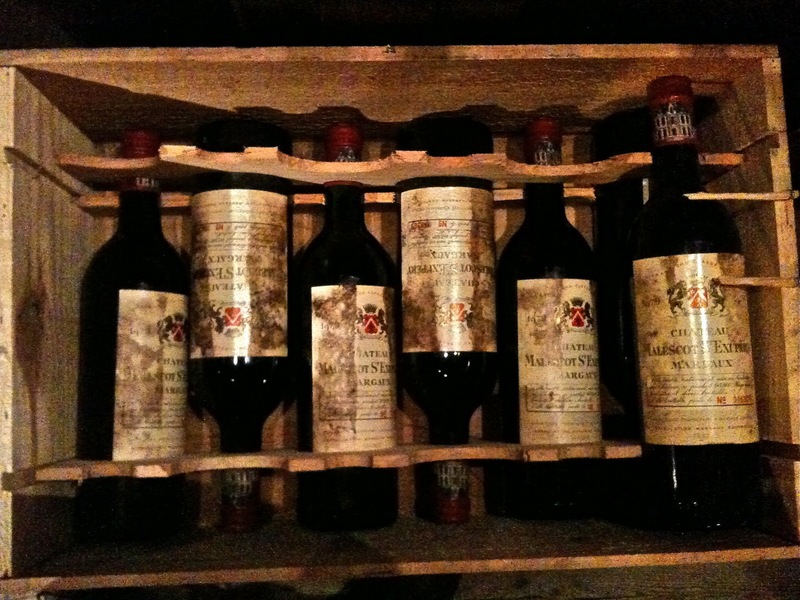 I also smelled the armchair leather in the '79 margaux. The smells coming out of that glass were simply stunning.